The last bread for this week features bell peppers, which don’t easily fall into either the “fruit” or “vegetable” categories. Bell peppers, in fact, are a member of the nightshade family, which also includes eggplants, potatoes, tomatoes, and tobacco. This, of course, means that tomacco isn’t such a crazy dream after all. It has actually taken me a considerable amount of time to warm up to roasted peppers. Maybe they’re just a little too sweet and savory for my tastes, or perhaps I never had properly made ones until recently, but they never really did it for me. Still, I’m not a huge fan of bottled roasted bell peppers, but I’ve taken quite a shining to the homemade sort. With this recipe, I highly recommend roasting your own. It’s incredibly easy, and the flavor is worlds better than anything you could ever buy. This recipe makes a fairly standard loaf of artisanal white bread, one with a chewy texture and moderately hard crust, but the sweetness of roasted peppers really shines in every bite, though it doesn’t overwhelm. The overall flavor is quite good, and well-balanced. You can certainly use any color pepper you like, but I love the pretty orange color that red peppers lend to the dough. I highly recommend trying it toasted with a generous spread of good hummus on top. It’s outstanding! 1. In the bowl of a stand mixer, whisk together the flour, powdered milk, and yeast. Add the milk mixture, and mix at low speed with the dough hook until the dough comes together, scraping the bowl if necessary. Increase the speed to medium-low and knead until smooth and elastic, about 6 to 8 minutes. You may need to add a spoonful or so of additional flour to achieve the proper consistency. The dough should be a little slack, but not wet, and should clear the sides of the bowl. 2. Turn the dough out onto a lightly floured surface. Knead a few times, until a skin forms around the outside of the dough. Pull the skin taught around the dough, forming a round ball. Transfer the dough to a lightly oiled bowl, turning to coat all sides with the oil. Cover tightly with plastic wrap, and let rise in a warm place until doubled in size, about 1 hour. Or, alternatively, you can refrigerate the covered dough for 8 to 24 hours. Let come to room temperature for at least 45 minutes before proceeding. 3. Turn the dough out onto a lightly floured surface. Press the dough out to a flat round. Spread the chopped bell peppers evenly over the surface of the dough, and fold the edges of the dough over the peppers. Press to seal. Knead until the peppers are evenly incorporated throughout the dough, sprinkling with additional flour as needed to keep from sticking. 4. Form the dough into an oblong loaf, and transfer to a greased or parchment-lined baking sheet. Cover loosely with lightly-oiled plastic wrap, and let rest in a warm place until doubled in size, about 1 hour. Thirty minutes before baking, preheat the oven to 400º F.
5. Using a sharp serrated knife, make one quick, decisive slash lengthwise down the bread. Bake at 400º F for about 30 minutes, or until well browned and baked through. An instant-read thermometer should register around 200º F when inserted into the center. Transfer to a rack to cool thoroughly before slicing. 1. To roast bell peppers, place the peppers on an aluminum foil-lined baking sheet 2 to 3 inches under a broiler preheated to high. Turning as needed, broil until charred and blackened all over. Wrap well in the aluminum foil and let stand at least 10 minutes. When cool enough, slip the blackened skins off and discard, along with the seeds and stems. Do not rinse with water, as this will wash away much of the delicious smoky flavor. Cut into strips lengthwise, then into small pieces; use as directed. 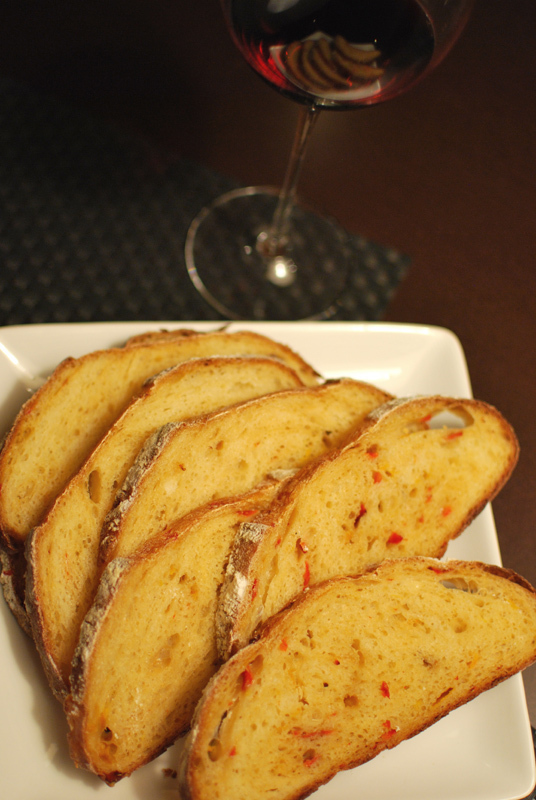 Adding roasted bell pepper to bread will do wonders to it’s flavour. I am gonna try it. I don’t know if it really comes across in this post, but this bread was just wonderful! I highly recommend adding homemade roasted bell peppers to your favorite bread dough; it’s quite delicious.